I got some new pretties that I have to show off! Check out my new Bakelite earrings by Mock Frog Jewelry! Mock frog is a mother and daughter team. They create these adorable pieces using vintage Bakelite poker chips and other vintage found objects. 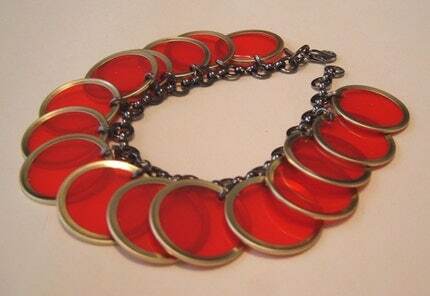 The above red bracelet is made from bingo chips. How clever! I'm a big fan of owls so I fell in love with this pair. Be sure to check them out. I love my new bakelite bangle. I found a whole jar full at an antique mall this weekend and to my surprise, they were all authentic! It was a close tie between this one and a cute green one to match my earrings but there's just something about the swirly root beer that I love! Maybe next time, Mr. Green! Hello, this is Rachel, one half of the MOCKFROGjewelry team [the daughter]. I'm glad you like your earrings, wear them well. thanks, darlin' I -love- them!! Ooohhh, I love the red bracelet!!! !